Our trip north in the ICW was slower than usual as we stopped to visit with friends along the way. Because of the torrential rains expected ( which did materialize ) we didn’t depart Vero Beach until April the 6th. That afternoon, we dropped anchor along the ICW, south of Cocoa Beach and in front of the house of friends, Ike and Carol of s/v Heron’s Wing. They kindly invited us ashore and we caught up on all of their news and shared a lovely meal. The next morning, we headed north again, to Titusville, only 20 miles away. There we had arranged to meet some friends from Toronto area who rent a condo at Cocoa Beach for the winter. That was Marcel and Karen, formerly from s/v Southern Cross. Together we spent a leisurely lunch chatting about the changes in the Bahamas and in our lives. The next day, we had arranged to meet up with Pete and Lani from s/v MarNel for an early breakfast. Pete had had surgery on one leg on Thursday and had cardiac bypass surgery earlier in the winter. These problems kept them in the US and close to medical help for the past winter. Otherwise, we had hoped to travel together as we had done many years ago. Pete has yet to have surgery on the other leg before they can start to make plans for the future. Hopefully, that surgery will also go well. Departing Titusvile near 10 am, we headed for the Haulover Canal Bridge. There we were delayed for about one hour while repairs were ongoing. 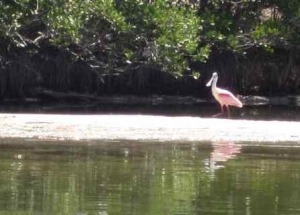 The silver lining in this cloud was my chance to take closer photos of a roseate spoonbill. This pink-winged bird flew in shortly after we anchored in the canal and he then proceed to wade slowly through a nearby pond. Even with the late start and the delay, we managed to arrive in Daytona just before dark. A vessel with a Port Stanley crew anchored nearby and we invited them to an impromptu dinner. The boat was Flight, from Green Cove Springs, owned by Jim from s/v Cheeseburger in Port Stanley. On board he had a crew member, Gary Foster who also sails from Port Stanley and who we have known for 30 years. Its a very small world on sailboats! Saturday and Sunday we pushed on northward, against our usual rules. But, by this time we wanted to make up for the delays. Sunday night found us anchored in Julington Creek, on the St John River just a few miles from the marina. Together we launched the dinghy and attached the outboard. Just at cocktail hour, we motored up the creek to a restaurant that we had enjoyed many times by land: Clark’s Fish Camp. After a wonderful meal, we headed back to our boat and started to think about the work to come. Reynolds Marina made us welcome once again and many of our friends were here, also de-commissioning their vessels. While I did several weeks worth of laundry, Murray poured gallons of water on the deck, sails and fixtures to wash the salt away. The sails were allowed to dry and then taken down, folded and stowed. The jobs flew by and the weather was lovely and actually almost too hot to work in the late afternoon. Haulout was scheduled for Sat the 16th and by 1 pm, we were buttoned down, loaded up and ready to head out. Thus ended our 14th season of cruising on Windswept IV. So, now we are home, call or drop by for a visit. We would love to see you anytime. We arrived safely in Ft Pierce, FL at about 0930 yesterday morning. We dropped the hook outside Harbourtown Marina and launched the dinghy. That allowed us to head ashore to call customs and then get a taxi out to the airport. After $30 for the cab and about an hour or so, we were all checked in with a new cruising permit in hand. Back at the boat, we made lunch and hauled the anchor once again. Sailing north in the ICW, we arrived at Vero Beach shortly after 1600 hrs. There we rafted up with a trawler named TicTac, owned by Dave and Brenda Johnson, old friends from Kitchener, ON. Brenda and Dave had kindly invited us for dinner and refused to allow us to lift a finger. By 2000 hrs, after being up for over 37 hours, we tottered back to our boat, showered to cool off and crashed right into bed. I don’t think either of us moved all night long. We plan to spend a day or so here and then head on north again. By some time this coming weekend, we should arrive at the marina. Then, we will prepare the boat for launch and pack up to head north, hopefully during the week before Easter.